Need to sharpen your skills to continue advancing in your career? Need to develop skills in house or quickly expand organizational capability? Need help completing your graduate coursework, thesis, or dissertation? Want to achieve personal thought leadership through original articles, blogs, books, or research? Want to use original writing or research to enhance your company's brand? Want to turn your academic work into articles, blogs, books, or other forms of thought leadership? Want to create new business offerings or shift your career path based on your personal thought leadership? Want to innovate your organization's offerings consistent with its thought leadership? Thinking about a master's or doctorate to strengthen your personal brand? /ˈbo͞ot ˌkamp/ noun. a short, intensive, and rigorous course of training: "a grueling, late-summer boot camp for would-be football players"
My business began nearly 20 years ago as a boot camp for master’s students struggling to finish their theses. I met with students in person, one-on-one; over the course of a few days of focused effort, they turned their unfinished work into a high-quality completed product. Today, in addition to a range of other services, I still operate boot camps. They still occur over 4 days, and still require significant effort; but the examples, tools, techniques, and instruction I provide have been finely crafted over decades. 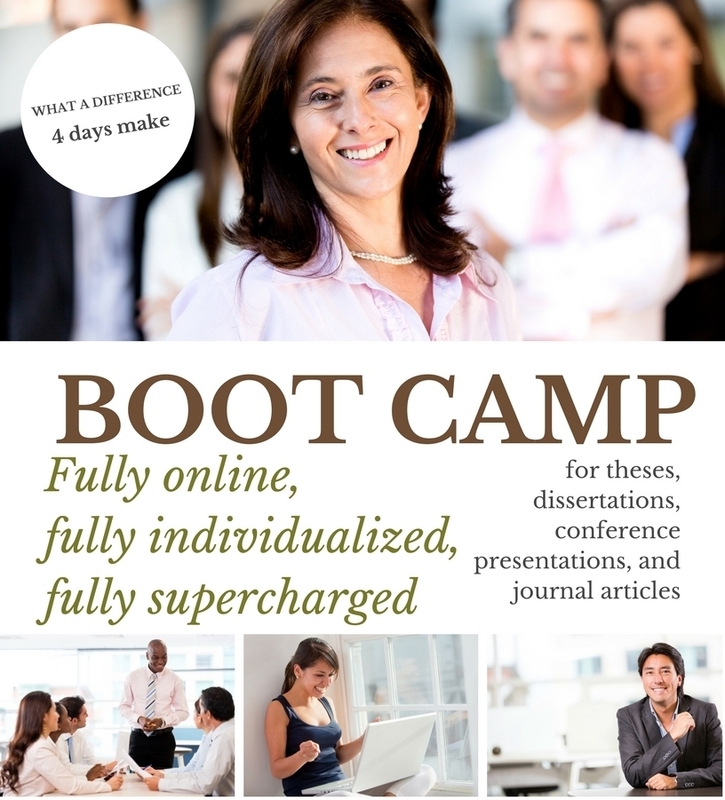 I now run boot camps for course papers, candidacy work, theses, dissertations, publications, presentations, books, career planning, and business concepts. Graduate students, professionals, executives, and thought leaders alike attend fully online camps customized for their needs. The common element across the camps is clear direction and structure, powerful questioning, and real-time feedback that enable you to skip the trial and error and simply produce high-quality, substantive work in a very short amount of time. Openings for our boot camps fill quickly, so be sure to schedule a complimentary consultation to find out if a boot camp is right for you. ONE FINAL STEP: We need to confirm your email address. Please click on the link in the email we sent you so you don't miss a thing!